A while ago I wrote about the heavenly facial I had with Marie Reynolds who is one of the best skin therapists I’ve ever come across. You can therefore imagine my excitement when once again I found myself on her table for her unique Masterlift treatment. This treatment offers a real alternative to lifts and injectables in addressing skin ageing. Marie uses all the most effective techniques she has to hand while completely tailoring each treatment to the individual. This really is bespoke work at it’s absolute best. The aim is to increase collagen, reduce fine lines and wrinkles and diminish pigmentation. As ever, a course of 6 is recommended. I only had one but loved it so much I will definitely be going back for more as soon as time allows. My skin felt and looked amazing afterwards. It’s now a week and I’m still feeling the glow. So what exactly did she do?? Well as you can tell from the photos above it definitely had it’s scifi moment. I’m quite claustrophobic so wasn’t sure I’d be able to handle the mask you see above but it was fine as it’s simply just placed on the face. Marie uses products from the fantastic Cosmedix range. They are newly arrived in the UK from America but I’m familiar with them and have used them on and off over the years. They are FANTASTIC so I’m very excited they’ve landed on our shores and will be writing about them in the coming months. Marie keeps the first Masterlift treatment very gentle while making sure that products used are still results driven but not too aggressive. Each treatment will then progress on from this starting point. She started with a good cleanse of my skin and then prepped it with a cranberry enzyme mask. She then applied a cocktail of super peptides, DNA factor and hyaluronic acid to use in conjunction with digital micro-needling. If you’re unfamiliar with micro-needling, it’s a great thing to know about. Sounds scary and painful but with the digital needle it really isn’t painful at all. It’s actually an ancient technique used to improve collagen production by creating a micro trauma on the skin releasing growth factors that promote scarless healing. It can actually increase collagen production by up to 1000% in one treatment!! It also creates channels that allow active ingredients to penetrate deeper into the skin. My skin felt quite tingly after this and I could just feel the products sinking into my skin ( ok I have quite an imagination but I could swear I actually felt it ). As if all this wasn’t enough she then put an apple stem cell mask on my face using Himalayan salt balls to massage it in. This was the point the weird looking mask was placed on my face for about 10 minutes. 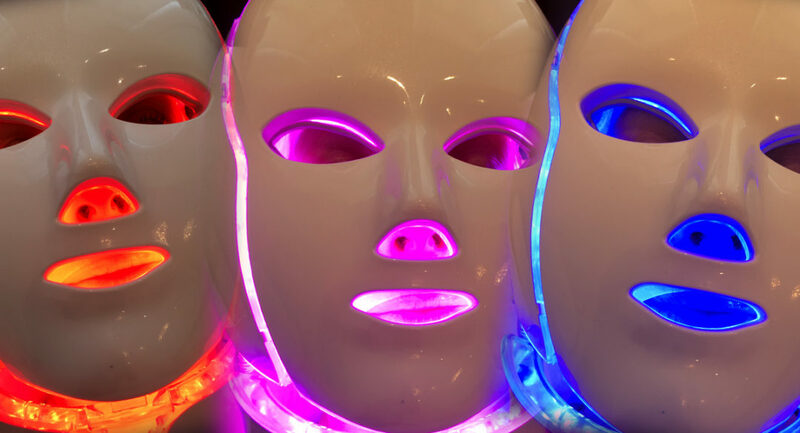 It’s actually there to administer LED galvanic and alternating light to improve collagen, rejuvenate and have an anti-bacterial effect on the skin. It emits the different coloured lights that you can see in the photos. She then removed the apple stem mask and massaged the residual serum into my face. Last but not least, she did a last bit of micro-needling right over my lips using hyaluronic acid once again. This plumped them right up and I could fell the blood flowing into them. She finished with a flourish of hydrating spritz over the face and opti crystals for the eyes. I thought this was one of the best treatments I’ve ever had. Obviously a course would be ideal but I would highly recommend this as a one off treat if you have something special coming up that you want to look your best for. Can’t recommend a needle treatment enough. Hyaluronic acid seems to be the way to go. How and where can I get this masterlift ? The Masterlift was created by Marie Reynolds and is only done by her. At the bottom of the article there is a link to her website where you can contact her directly. She works out of Fortnum & Mason’s one day a week and the rest of the time out of her clinic in Norfolk. As you can imagine her days in London get pretty booked up.